How many times have you had a medical issue that leaves you with a number of questions and most of all unsure of how you should handle it? The Merck Manual Home Symptom Guide is an app to be used on your iPod touch, iPad, and iPhone and provides you with all kinds of medical recommendations that are given to you in an easy-to-understand way: that means no confusing doctor talk. It’s a no-nonsense approach that can help you treat a problem, decide if you need to see a doctor or visit the emergency room, and help you gauge just how serious the problem is. With this app you can browse through more than 100 of the most common medical issues that pop up with people. These include things such as fever, headache, nosebleeds, sore throat, and a whole lot more. You can read an easy-to-understand description of the problem and then see what the recommendations are. There are also causes, evaluation, treatment, and warning signs for symptoms. It’s like having your own doctor on-hand to answer common questions. The way it works is that you can search by symptom in order to find the issue that fits it and gather more information from there. This app was released late last year and doesn't yet have any updates or a customer rating. There are no customer comments at this point. This app is really loaded with information. Besides the details covered above you can also find charts, tables, and figures all designed to help you and make your medical problem much easier to understand and therefore treat. There are prevention recommendations as well as age-related recommendations so even if you aren't ill you can read through this and follow them in your everyday life. There is the ability to bookmark information so you can return to it any time. The Appendix is a wonderful tool where you can read descriptions of common medical tests. All too often doctors use confusing medical jargon so here's a way to understand what it is they are talking about. The user interface is very simple and uncluttered, making the experience that much smoother for users. It makes finding answers fast and depending on the medical issue speed is of the essence. Of course it’s always best to talk to your doctor if you have any sort of problem but this is a good way to gather information and lead you in the right direction. 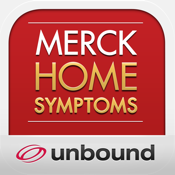 The Merck Manual Home Symptom Guide app can be used on your iPod touch, iPad, and iPhone to help guide you in the right direction.